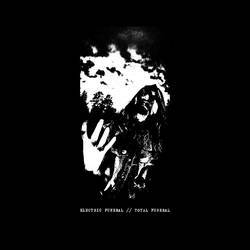 Total Funeral is the entire anthology-to-date of Electric Funeral, the one-man Swedish raw punk hobbyhorse manned by Jocke D-Takt. And holy crap is it ever unnecessary. We’re talking about 53 songs that, to the untrained ear, are nearly indistinguishable from one another. Southern Lord, as is their wont, reached into their deep-ish pockets to compile material from yet another act that’s largely unknown outside the crust scene. Total Funeral brings together Electric Funeral’s Harvester Of Death, Make Noise Not War, D-Beat Noise Attack, The Face of War, Make A Change, Gröndalen, In League With Darkness and Order From Disorder releases, as well as their split with Go Filth Go and several previously-unreleased tracks. And while its excessiveness is perhaps its greatest deterrent, Total Funeral is still cool for a couple of reasons. First of all, it’s some of the filthiest, noisiest, and most pissed-off, bludgeoning D-beat your ruptured eardrums will have the pleasure of suffering through this year. Pure hatred, anguish, and dissatisfaction—the true spirit of punk rock bleeds through on every song. Considering D-Takt has done time in bands such as Paranoid, Desperat, Warvictims, Totalt Jävla Mörker and countless others, there's no questioning the authenticity here. And secondly, from a completionist standpoint you have all of this material in one place, which makes it easy to track Electric Funeral’s evolution from release to release. It should be noted though that when we talk about D-beat in terms of evolution, were talking more about subtle nuances than we are noticeable shifts in sound or overall growth as an artist. D-beat is D-beat after all. The Make Noise Not War songs have a fuller guitar sound than Harvester of Death ones, while the three tracks from the split with Go Filth Go are more structured and crunchy and the vocals come in two styles of scream instead of one. D-Beat Noise Attack is a lo-fi, muffled recording that brings to mind an old Deprived / Masskontroll split cassette I've had kicking around the floor of my car underneath all the empty chip bags and chocolate milk containers. And it doesn’t get much more blown-out than the ear-piercing white noise on the Gröndalen songs. The whole thing clocks in at over an hour and half of music. Although it does come as a double LP (on "blood red" and "beer piss yellow" vinyl) which makes it easy to split into four separate listening sessions if need be. Overall an assemblage like this will appeal mostly to collectors and/or those the worship at the altar of Southern Lord. But if you're into Disclose, Krömosom, Mauser or other bands at the forefront of the raw punk movement you will find plenty to dig into here. Posted Aug. 4, 2014, 11:50 p.m.
Posted June 23, 2014, 9:17 p.m.